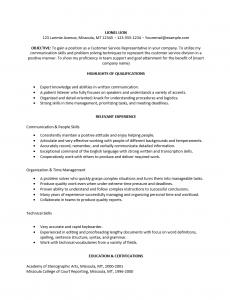 The Functional Customer Service Resume Template can be of significant use to a job hunter who prefers to send a resume that focuses less on work history and more on skills and achievements. This can be a particularly attractive format if used wisely, for instance if an applicant has worked in one company either for a short or long period of time, the work history section may look rather empty. Similarly if an applicant has worked in a large number of places the resume may look clunky or difficult to read. The goal of any resume is to help a job applicant obtain an interview with an institution of their choice for a desired position and this will require it be a robust and attractive document. Since a Functional Customer Service Resume will focus on skills and achievements it is particularly important that it be customized to the particular job position an applicant is interested in. For instance, while retail customer service and call center customer service both share some requirements they will differ significantly in others. 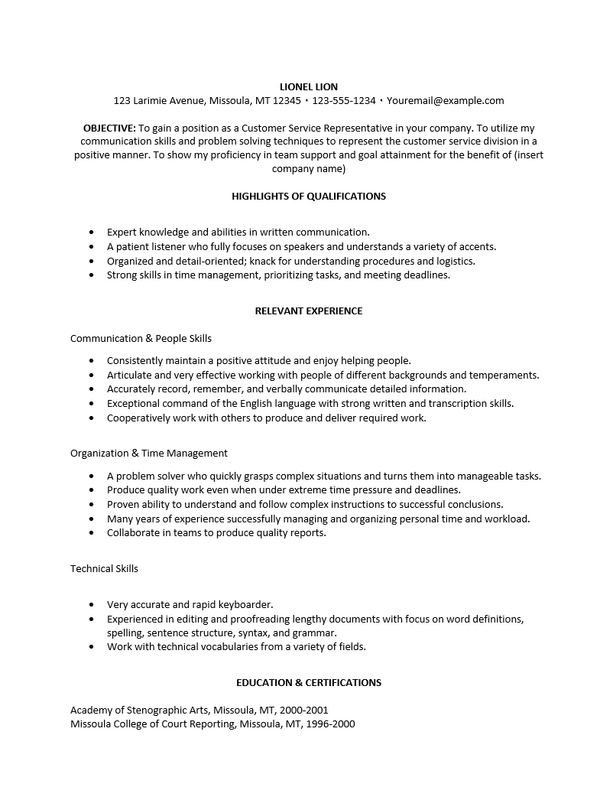 A Functional Customer Service Resume Template will add a level of organization to one’s job search so that a job seeker can enjoy the benefits of responding to job listings quickly with a resume customized to that employer’s needs. This type of preparation will not only save an applicant time and effort but will also increase the chances of gaining an in-person interview. Step 1. The top lines are reserved for the name and contact information of the applicant. It would be wise to make this an attractive and eye catching font. If the contact information is particularly long try experimenting with using a smaller (but legible) font before shortening it or using abbreviations. Step 2. The next step is to fill out the “Objective” section, this will be a few sentences meant to set up the rest of the resume and giving the potential employer an opportunity to hear the candidate’s professional voice. Step 3. The “Highlights of Qualifications” section is meant as a preview of skills that answer the job listing’s position requirements. This should be a somewhat medium sized section composed of quick and catchy bullets defining your skills and attributes. It is highly recommended to review both the job listing and the resume to make sure this section is accurate and draws the recruiter to the next section. Step 4. The “Relevant Experience” should also be geared towards the job requirements but will draw on previous experience as opposed skills. This section will feature bullet points of actions, achievements, and duties the candidate has actually done. It is a wise idea to subdivide these into appropriate categories rather than bulk them up into a very long list that may look tiring to read. Step 5. The “Education and Certifications” sections should list the specifics of a candidates academic history. This should include where a candidate studied, the diploma or certificate they earned, where it was earned, and finally the dates the candidate attended that educational facility. Step 6. The real difference between a functional resume and others is its minimization of the “Work History” or “Professional History” section. Since all the information about experience has been reported in the “Relevant Experience” section a candidate only needs to report the bare bone specifics of their employment history. Write, in descending chronological order, the name, location, and dates worked for previous employers. It should be noted that a functional resume looks best if there are too few or too many employers in ones past.